Ste. Agathe (pop. 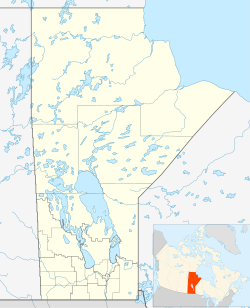 631 in 2016) is a primarily francophone community in the Canadian province of Manitoba. It is located along the Red River in the Rural Municipality of Ritchot. The village was founded in the mid-19th century on one of the Red River Trails by settlers from Quebec named Grouette, who built a homestead on the west bank of the Red River and farmed grain in the rich soil of the valley. A dock allowed other settlers to reach the east side of the river via ferry with their grain-laden Red River carts; a community, originally called Pointe-à-Grouette, formed around the docking point at some time before 1871. The first mention of the name "Ste. Agathe" was some decades earlier, when the Roman Catholic Church organized the Red River colonies between St. Norbert and the United States border into the Parish of Sainte-Agathe. As that parish grew and split into numerous more manageable parishes, the parish containing Pointe-à-Grouette was renamed the Parish of Sainte-Agathe by Archbishop Alexandre-Antonin Taché in 1873; the town adopted the name at some time after that date. A church, a school, and eventually a convent were built at the townsite. Ste. Agathe is located in the flood plain of the Red River and as such has always been prone to flood damage, but none was so severe or as notable as that experienced during the 1997 Red River Flood. The ring dike surrounding the town gave out in late April, causing the town to be inundated with over two metres of water. The village has recovered; a new dike has been built and an interpretive centre has been created on the west side of the community. Ste. Agathe is in the provincial riding of Morris and the federal riding of Provencher. ^ "Census Profile, 2016 Census". Statistics Canada. 2017-01-23. Retrieved 2017-04-25. ^ a b "Ste. Agathe booming since 'flood of the century'". CBC News. April 27, 2007. Retrieved January 9, 2017. ^ History of Ste. Agathe (in French) Archived 2001-04-22 at the Wayback Machine. Accessed August 12, 2008. ^ Ste. Agathe falls victim to the flood. CBC News, broadcast April 29, 1997. Accessed August 12, 2008. ^ Red River Valley Floods Interpretive Centre Archived 2009-11-19 at the Wayback Machine. Accessed August 12, 2008. This page was last edited on 18 February 2019, at 16:41 (UTC).